Grains seeing a little strength overnight. Wheat up 3 cents, corn up a penny, and beans up 4 cents. Jair Bolsonaro won Brazil’s presidential runoff election yesterday with 56% of the vote. Brazil’s currency, the Real, is sharply higher this morning on the news. Daylight Savings time ends this coming Sunday, November 4th. Clocks “Fall back” an hour. NASS announced they will re-survey the harvested acres of several crops, including soybeans and cotton in SC, AL, GA and FL, post-hurricane Michael. If the results warrant it, they will include adjustments in the November 8th USDA report. AgRural says Brazilian farmers have planted 46% of their soybean crop so far versus 30% a year ago and 28% average. US soybean exports have plunged as the US-China trade battle extends into what is usually a typically high season for the oilseeds. Soybeans inspected for export since early September are down 39% from year-ago levels according to JP Morgan. 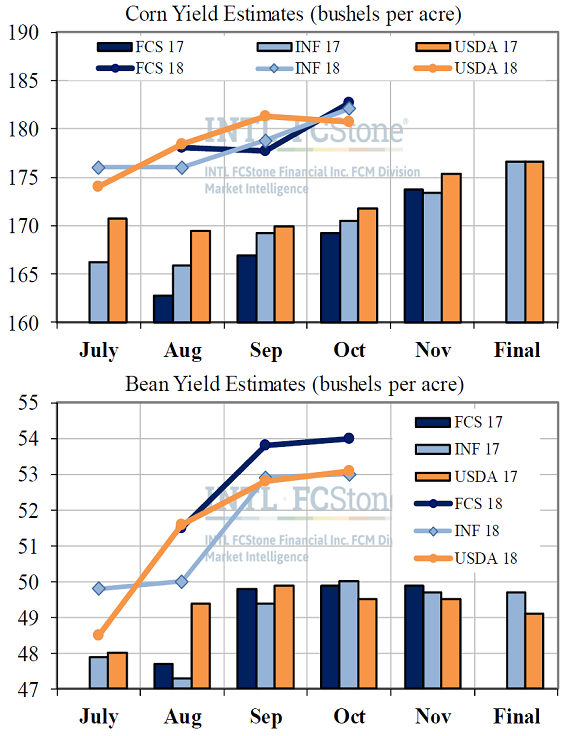 The next round of monthly corn and soybean yield estimates fires up again on Thursday with INTL FCStone’s November survey. Corn yield estimates increased all the way up through the final Jan figure last year, but the USDA trimmed their number last month, and they had tended to “lead” the private figures the previous couple months; the trade will be expecting steady-to-lower corn yields this month. The same should go for soybeans where most have congregated in the 53 bpa area into an unfavorable harvest.